How much does it cost to travel to Puerto Jimenez (Corcovado National Park)? How much money will you need in Puerto Jimenez (Corcovado National Park)? ₡46,569 ($78) is the average daily price for traveling in Puerto Jimenez (Corcovado National Park). The average price of food for one day is ₡14,004 ($24). The average price of a hotel for a couple is ₡40,000 ($67). Additional pricing is in the table below. These average travel prices have been collected from other travelers to help you plan your own travel budget. How expensive is Puerto Jimenez (Corcovado National Park)? How much money do I need for Puerto Jimenez (Corcovado National Park)? Situated in the Golfo Dulce, Puerto Jiminez has grown from a logging and gold mining town in the 1960s to become the largest town on Costa Rica's Osa Peninsula. Today, it serves as a main gateway to Corcovado National Park, a last stopping point before visitors enter the park. 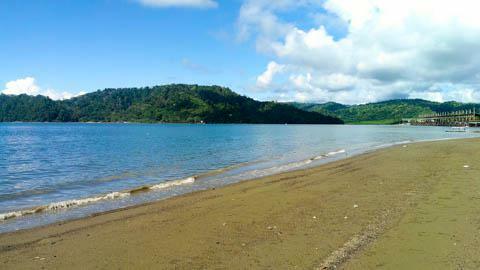 Puerto Jiminez also has a lively night life, a beach, and easy access to a number of outdoors activities. Nature and wildlife are amongst the main attractions near and around the town of Puerto Jiminez. Being the only town before entering Corcovado National Park, it is isolated preserving most of the natural wonders of the area. Scarlet Macaws are an especially unique sight, a bird species native to the tropical climate, as are about four species of monkey that inhabit Costa Rica. The area's mangrove swamps and humid rain forests especially are home to a myriad wildlife including the macaws, white-faced monkeys, caiman, and ocelots. Looking out to the water, in Golfo Dulce, another whole range of fauna can be found beneath the surface. Golfo Dulce's warm waters are home to many dolphins and as well as humpback whales who give birth there. And then there are the pristine beaches set against aqua blue waters that make for perfect surroundings to relax the day away. Be sure to catch a sunset on the Golfo Dulce as well. The hub of town is set on a grid pattern of dusty roads, lined with a variety of colorful restaurants and bars, small shops, hotels, and boarding houses that cater to visitors passing through. Most people frequent the downtown as a waypoint on the journey to the neighboring Corcovado National Park. It is a great place to stock up on supplies and enjoy beach activities during the day, while the nighttime really revs up with locals and visitors alike frequenting bars and pubs to party the evenings away. Puerto Jiminez began to grow with gold mining and logging industries in the 1960s, and now exists as the largest town on the peninsula with a population of about 1,780. While Puerto Jiminez itself is a small, quiet coastal town, the surrounding wilderness makes for a whole range of fun outdoor activities. Out on the turquoise waters, visitors often set out on sea kayaking voyages, fishing, as well as dolphin and whale watching trips. There are also programs for scuba diving in addition to powerboat excursions and just about any other kind of water activity you can think of. The shoreline serves as a paradise for any beach bum and for those seeking a thrill with watersports like surfing. You can relax the day away taking in the view, or jump right into the waves for a nice swim in the sea. On the mainland, there are opportunities for Mangrove forest exploration, jungle hikes, and bird watching, as well as bike trips and horseback riding on along a network of trails. Corcovado National Park is the place to go for many of these inland activities. There are a number of agencies in town who can help with organizing any activity. When it comes to dining, Puerto Jimenez serves up an authentic blend of Costa Rican cuisine infused with South American, Asian, and European influences. Anything Costa Rican will be described locally as "Tico." For example, most Tico dishes are accompanied by fresh fruits and vegetables, as well as a serving of rice and black beans. As a coastal town, Puerto Jiminez also has a large selection of fresh fish seafood on the menus of most restaurants. The local night life and bar scene is also very active, some restaurants converting to pubs after hours for some late night fun. Typical Costa Rican food can be found at a place called Carolina's, seafood and Mexican fare at Juanitas Mexican Bar and Grille, Italian and pizza at Ristorante Giardinia, and a mix of Mediterranean, Mexican, and seafood is available at the beachside eatery, Perla de Oso. Perla de Oso and a number of other places also feature occasional live music entertainment, like salsa. Coffee, one of Costa Rica's largest exports, is also a specialty. By plane, there is a small airport in Puerto Jiminez served by SANSA and NatureAir. Flights generally run from San Jose once or twice daily. The airport in San Jose is called San Jose International Airport. Buses to Puerto Jiminez also leave daily from San Jose. The ride takes about 8-10 hours. There is also a ferry that runs twice daily from Golfito to Puerto Jiminez, taking about an hour and a half. There are a number of fast ferries as well that can do the trip in 30 minutes.